Seeta Uthaya Kumar, U., Paridah, M. T., Owolabi, F. A. T., Gopakumar, D. A., Rizal, S., Amirul, A. A., Rahman, A. A., Alfatah, T., Mistar, E. M., Sri Aprilia, N. A., and Abdul Khalil, H. P. S. (2019). "Neem leaves extract based seaweed bio-degradable composite films with excellent antimicrobial activity for sustainable packaging material," BioRes. 14(1), 700-713. Seaweed-based biodegradable films were studied with incorporation of different concentrations of neem (Azadirachta indica) leaf extract. The films were fabricated via a hot casting method and were subjected to physical, mechanical, and morphological examinations to investigate the effect of the neem extract reinforcement in the edible film. There was moderate improvement in the tensile strength, contact angle values, and elongation at break values, while the water vapour permeability was reduced with the addition of neem leaves extract beyond 5 w/w %. Analysis of the morphology of the fabricated films confirmed that there was good dispersion of the neem leaves extract in the seaweed matrix films, which resulted in the enhanced mechanical strength of the fabricated films. 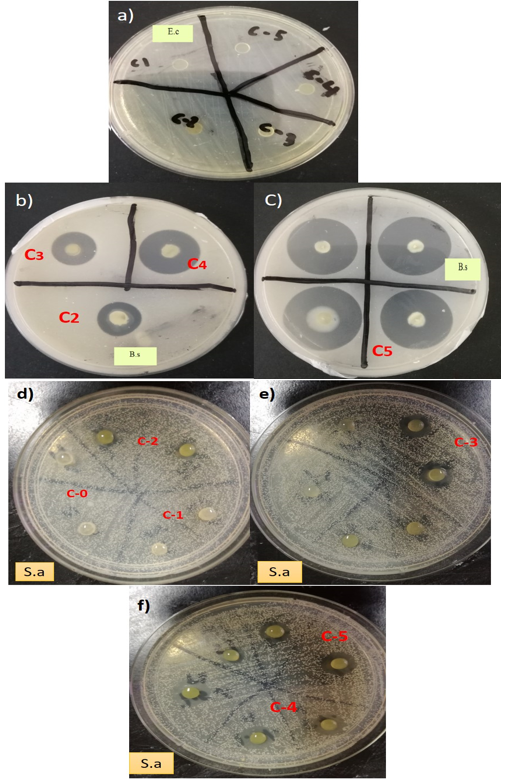 Moreover, the fabricated composite films showed excellent antimicrobial activity towards both Gram-positive bacterium subclasses (coccus and bacillus), which is highly desirable for the packaging material in the current scenario. So far, this is the first report on neem leave based seaweed films with enhanced antimicrobial activity, which makes them suitable for sustainable packaging application. The experiments showed that the seaweed-based film incorporated with neem leaves extract has potential application as an active packaging material due to its enhanced mechanical properties and antimicrobial activity. Neem is a non-toxic plant that possesses excellent antimicrobial properties. Neem (Azadirachta indica) extract, or its essential oils, have exhibited antimicrobial activity against food-borne pathogens such as Bacillus cereus and Staphylococcus aureus, which inhibits food spoilage (Jeevanandam et al. 2017). Phytochemical screening of neem leaves has revealed the presence of compounds such as glycosides, tannins, alkaloids, flavonoids, reducing sugars, steroids, and carbohydrates (Manikandan et al. 2009). The presence of potentially pathogenic microbes (bacteria, viruses, and fungi) in the ecosystems is very dangerous, especially in healthcare institutions, where people are generally more vulnerable. With the current global shift to biodegradable films as barriers in medical, food, and cosmetic industries, there is a need for the development of potent but non-toxic antimicrobial biodegradable composite polymers (Ullah et al. 2015). These products would mitigate the growth of pathogenic microbes on biodegradable films, hence prolonging their shelf life (Lee et al. 2018). Some plants show antimicrobial activities due to the presence of bioactive constituents such as tannins, flavonoids, alkaloids, and saponins (Harun et al. 2016). Among the array of such plants is neem (Azadirachta indica). Recently, it has been reported that the neem essential oil extract has antibacterial activity against 14 strains of pathogenic bacteria, while the neem leaves extract generally shows higher antimicrobial activity against Gram-positive bacteria and has effectively inhibited the growth of 21 strains of food-borne pathogens (Manikandan et al. 2009). Seaweed is a feedstock for the bio-economy and is one of the largest unexploited global biomass resources (Hosseini and Wahid 2014). It is a source of sustainable food production as well as a replacement for fossil resources, but recently seaweed has been widely reported for its application as a biopolymer (Saurabh et al. 2016). The merits of biodegradable films over synthetic materials include their renewability and edibility. These films are effective carriers of nutrients, anti-browning agents, and colorants compared with synthetic films, in terms of improving food quality (Hassan et al. 2018). To enhance the quality of experimental films, additives, such as antioxidants and antimicrobial agents, have been coated on the surface or incorporated into bio-polymer based films (Atarés and Chiralt 2016). It has been reported that the films incorporated with plant extracts can serve as packaging materials with excellent antimicrobial activity (Abdul Khalil et al. 2016). Seaweed films have gained considerable interest in food packaging applications due to their flexibility, resistance to microwave radiation, and excellent antimicrobial and antioxidant properties. However, extensive studies on the usage of neem leaf-based seaweed film as a packaging material are limited. In this study, the applicability of fabricated neem leaf-based seaweed film for packaging applications was investigated. The prime novelty of the demonstrated work is that the neem leaf-based seaweed film has excellent mechanical properties and antimicrobial activity, which is highly desirable for a packaging material in the current scenario. The ethanol and glycerol were purchased from Sigma-Aldrich (St. Louis, MO, USA). The neem leaves were purchased locally. The fully matured Azadirachta indica (neem) leaves were collected and washed under running tap water to remove any dirt prior to the drying process. The leaves were air dried for 20 days, then ground into a powder and stored in airtight bottles. An ethanol extraction on the neem extract was carried out by soaking the powdered neem leaves (170 g) in 95% ethanol (1700 mL) and in a covered 1L conical flask placed in a reciprocating shaker at 28 °C for 24 h. Then, the extract was filtered using Whatman No. 42 (125 mm) filter paper and cotton wool. The obtained filtrate solution was concentrated using a vacuumed rotary evaporator (Buchi Rotavapor R-200, Flawil, Switzerland) with the hot water bath set at 40 °C. The dried residue was collected and stored at room temperature (28 °C). The film solutions were prepared by dissolving the seaweed (1%, w/v) in distilled 107 water via magnetic stirring for 15 min at 82 °C. After the addition of glycerol (50 w/w % 108 of seaweed), stirring was continued for another 25 min. The slurry obtained was added 109 with different concentration of neem leaves extracts (0.5 w/w %, 1 /w/w %, 2.5 w/w%, 5 110 w/w %, and 7.5 w/w % seaweed). The film solution was casted on a Teflon-coated plate 111 and then oven-dried at 40 °C for 24 h. After drying, the films were removed from the 112 plate and stored in a desiccator at 53% relative humidity for 72 h before analysis. The seaweed films were cut into strips (2 cm × 15 cm). The film thickness was randomly measured with a micrometer at five different locations on the film, and the thickness was reported as the average of the five measurements. where WVTR is the measured water vapor transmission rate (g / (m2 s), L is the mean film thickness, and Δ P is the partial water vapor pressure difference (Pa) across the two sides of the film. The wettability of the films was evaluated using a contact angle meter. The static contact angle (CA) measurement was determined using a KSV CAM 10 (KSV Instruments Ltd., Espoo, Finland), where the sessile drop technique was applied. A drop of test liquid was uniformly placed on the film surface, and the image was recorded for 5 s at a speed of 5 fps. Each sample was repeated 5 times, and the mean value of each film was calculated. The mechanical properties of the films were evaluated using a Miniature Tensile Tester MT1175 (Dia-Stron Limited Instruments, Andover, UK) programmed with UvWin1000 software (Dia-Stron Limited Instruments, Andover, UK), in accordance with the ASTM D882-02 (2002) standard and conditioned at 58% RH and 28 °C. Samples were cut off in a regular manner with a length of 150 mm and a width of 5 mm. The mechanical parameters were the average of a minimum of 5 measurements of each film sample. The tensile strength (T) and elongation (E) were obtained from the tension vs. elongation curves. Mechanical properties of the films were evaluated using a Miniature Tensile Tester MT1175 (Dia-Stron Instruments, UK) programmed with UvWin1000 software (Dia-Stron Limited Instruments, Hampshire, UK), in accordance with the ASTM D882-02 (2002) standard and conditioned at 58% RH and 28 °C. Samples were cut off from regular with a length of 150 mm and a width of 5 mm. The mechanical parameters were the average from a minimum of 5 measurements of each film sample. Tensile strength (T) and elongation (E) were obtained from the tension vs. elongation curves. The surface morphology of the films were analyzed by SEM, Zeiss EVO MA10 (Carl Zeiss, Oberkochen, Germany). The film samples were placed onto the SEM holder with double-sided electrically conducting carbon adhesive tape to prevent a surface charge from forming on the samples when they were exposed to the electron beam. The films surfaces were then coated with a thin gold-palladium layer using a Polaron (Fisons) SC515 sputter coater (Fison Instruments, VG Microtech, Susse, UK) before observing the microstructure. The SEM applied a focused beam of high energy electrons to produce a variety of signals at the surface of the solid specimens. Images were registered at 100 x magnification. FTIR analyses of the films were carried out using an attenuated total refraction method (ATR) in an infrared spectrometer (Spectrum 8900 IR Spectrometer, Shimadzu, Japan). Film specimens to be analyzed were cut into square shape with a dimension of 10mm x 10mm and then oven dried at 60 ºC for overnight. During analysis, the specimen was placed in the zinc selenide ATR cell. Spectral measurements were performed in transmittance mode. The spectra of the films were carried out in the range of 400 to 4000 cm-1. Three different food pathogens including Staphylococcus aureus, Escherichia coli, and Bacillus subtilis were used for testing. All the bacteria strains were cultured at 37 °C for 24 h. By appropriately diluting with sterile solution, the cultures of bacteria containing 107 CFU/mL were prepared and used for the antimicrobial test. Film samples were punched to make disks (6 mm), and the antimicrobial activities were determined using an agar diffusion assay (disk test). Agar plates were inoculated with 100 μL of bacterial cultures grown overnight (colony count 107 CFU/mL). Film discs were placed on the inoculated agar plates. The plates were incubated at 37 ºC for 24 h. The diameter of the inhibition zone was measured with a caliper and indicated by mm as diameter of the zone. Analyses were conducted in triplicate. Data were analysed using SAS (Windows version 9.0, Cary, NC, USA) software. Analysis of variance (ANOVA) and Duncan’s multiple range Test (DMRT) were used to compare any significant differences between solvents and samples. Differences were considered significant at P < 0.05. All the analyses were carried out in triplicates while results were expressed as a mean ± standard deviations (SD). The effects of incorporation of neem leaves extract on the physical properties of seaweed films are shown in Table 1. Homogeneous, thin, flexible, uniform, and transparent films were obtained from seaweed-neem leaves mixtures via the casting method. Seaweed produces flexible, transparent, and uniform films due to its viscoelastic nature. The incorporation of neem leaves extract did not result in any significant change (at p > 0.05) in the thickness of the films at the lower neem extract loads. However, at higher neem extract loading (0.5 w/w % to 7.5 w/w %) the thickness of the seaweed film significantly increased (0.093 to 0.112 mm). Contact angles of seaweed films incorporated with neem leaves extract at different amounts are shown in Table 1. The neat seaweed film had low water contact angle of 44.45° ± 0.56 and then it was enhanced up to 71.45° upon the addition of 7.5 % neem leaves extract. From this, it can be concluded that the incorportation of neem leaves extract into seaweed film decreased the hydrophilicity of the seaweed film. This facilitated the reduction in the water vapor permeability which is higly desirable for the packaging application. The reason for the enhanced contact angle after the incorporation of neem leaves extract was due to the hydrogen bonding between the hydroxyl groups in seaweed and hyroxyl groups in neem leaves extract which reduce the availability of hydroxyl groups, thereby resulted in the moderate enhancement in the contact angle (Balakrishnan et al. 2018). *Readings are the mean ± standard deviation. *Means in each column with different superscript letters are significantly different (p < 0.05). Water vapor permeability (WVP) generally occurs through the hydrophilic portion of the film; thus, water vapor permeability depends on the hydrophilic-hydrophobic ratio of the film components. Muangrat and Nuankham (2018) reported that the WVP increased with polarity and water absorption properties of the polar part of the film. As shown in Table 1, the WVP of the neat seaweed film (9.37 × 10-10 (g/msPa) was reduced to 4.42 x 10-10 (g/msPa) by the incorporation of neem leaves extract (7.5 w/w %). This reduction of WVP was due to the hydrogen bonding between the hydroxyl groups in seaweed and hydroxyl groups in neem leaves extract, as shown in the FTIR spectra (Fig. 1). Hydrogen bonding reduced the availability of hydroxyl groups, which resulted in the enhanced water contact angle, and the reduced water permeability. This observation was comparable with the previous results on edible film obtained from psyllium seed (Plantago ovata Forssk.) and methylcellulose films plasticized by polyethylene glycol and Kappa-carrageenan nanocomposites films incorporated with Zataria multiflora essential oil (Ahmadi et al. 2012; Shojaee-Aliabadi et al. 2013). The fabricated neem leaves extract based seaweed films could perform as an excellent barrier to water vapor due to their reduction in the hydrophilicity resulting from the effective hydrogen bonding between hydroxyl groups in seaweed and hydroxyl groups in neem leaves extract. 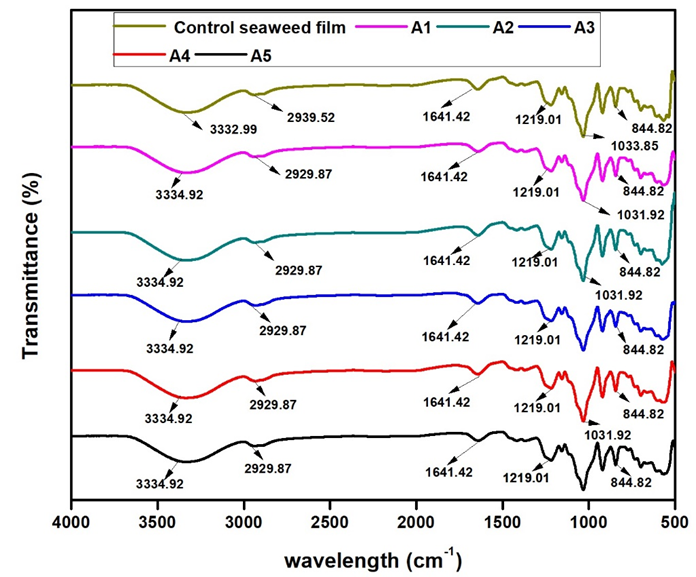 Fourier Transform Infrared Spectroscopy Figure 1 shows the FTIR spectra of control seaweed film and seaweed film with varying percentages (0.5%, 1%, 2.5%, 5%, 7.5% ) (A1-A5) of neem leaves extract. There were no major differences in sharp peaks between the control seaweed film and the film incorporated with neem leaves. Both the control seaweed film and the other composite films showed the presence of very strong absorption bands at the 3200 cm-1 to 3600 cm-1 region (corresponding to the OH group), the 1000 cm-1 to 1200 cm-1 region (due to C-O stretching), and the 925 cm-1 to 935 cm-1 region (due to the C-O in 3,6-anhydro-D-galactose). FTIR absorption bands of the control seaweed film and other composite films (A1 to A5) at 3333.0 cm-1 and 3334.9 cm-1 were due to the complex vibrational stretches related to intra, inter, and free molecular hydroxyl groups. The hydroxyl groups in the film contribute to the hydrophilic ability of the seaweed-based films. This result indicated that there were interactions between the hydroxyl groups in seaweed polymer chains and the hydroxyl groups of neem leaves extract. The FTIR spectras also showed strong absorption bands in the 1210 cm-1 to 1260 cm-1 region that correspond to the S=O group in the sulfate esters in the 840 cm-1 to 850 cm-1 region, which was due to the C-O-SO3 group in D-galactose-4-sulfate. This observation was similar to the spectral band of seaweed as summarized by (Pereira et al. 2009). The functional groups in 3,6-anhydro-D-galactose and D-galactose-4-sulfate provide gelling ability and mechanical support to the seaweed structure (Pereira et al. 2013). The FTIR absorption bands at 2939.5 cm-1 and 2929.9 cm-1 were due to –CH3 stretching. The FTIR spectra showed the chemical structure of protein at absorption bands located at the 698.2 cm-1 region and a C=O group at 1641.4 cm-1 and 1371.4 cm-1. The absorption band in the 1300 cm-1 to 1450 cm-1 region indicated the presence of flavanones/terpenoids in the films with neem leaves extract. The absorption band at the 1641.4 cm-1 region indicated stretching molecules of conjugated peptide bonds by acetone and amine groups. *Readings are the mean ± standard deviation. Means in each column with different superscript letters are significantly different (p < 0.05). The elongation at break value of the control seaweed film was 17.6%, as shown in Table 2. The incorporation of neem leaves extract (0.5 w/w% to 7.5% w/w) into seaweed films increased the elongation at break value from 17.6% to 20.7%. Here the incorporation of the neem leaf extract could be acting as a platicizer, which would result in the moderate enhancement in the elongation at break value of the seaweed film. Moreover, the hydrogen bonding interaction between seaweed and neem leaves extract resulted in a increase in the film’s elongation. These results were comparable with the findings from Siripatrawan and Harte (2010), where they incorporated green tea extract into chitosan film. They reported that the incorporation of green tea extract into chitosan films slightly improved the tensile strength and % elongation due to the interaction between chitosan matrix and polyphenolic compounds from green plant extract (Siripatrawan and Harte 2010). 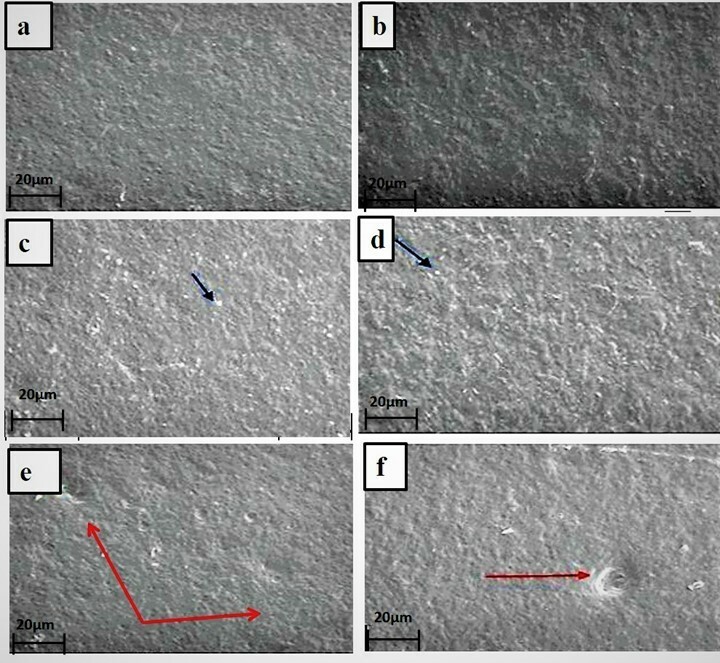 However, the tensile strength value of the neem leaves extract based seaweed film (7.5 w/w %) had been reduced to 34.6 MPa, which was mainly due to the agglomeration of neem leaves extract, resulting in the formation of cracks and holes at their higher loading of the seaweed polymer matrix as evidenced in the SEM (Fig. 3) observation. Fig. 2. Scanning electron micrographs of the surface of seaweed based film (a) control, (b) 0.5 w/w %, (c) 1 w/w %, (d) 2.5 w/w %, (e) 5 w/w % and (f) 7.5 w/w % at 100 times magnification. The red arrows indicate the holes and crack in the films. While the blue arrows indicate the pores. Table 3 shows the effect of neem leaves extracts at different percentages on the antimicrobial activity of the composite films. The antimicrobial activities of the films at different percentages of neem leaves extract (0.5 w/w%, 1.0 w/w %, 2.5 w/w %, 5 w/w %, and 7.5 w/w%) were tested against Escherichia coli, Staphylococcus aureus, and Bacillus subtilis. The neem leaves extract-based seaweed films showed inhibitory zones against Staphylococcus aureus and Bacillus subtilis, but there was no inhibition observed for Escherichia coli. The difference in the antimicrobial activities against bacteria was due to the lipid bilayer composition of bacterial strains and the degree of depolarization and permeability of the cell walls (Maragathavalli et al. 2012) Increasing permeability and a greater degree of depolarization were expressed in the lipid bilayer of the Gram-negative bacteria in response to this cembranoid because the Gram-negative bacteria contain more lipids in their cell walls. Previous studies reported that this depolarization effect was associated with hydrogen bonding on the hydroxyl group in the carboxylic functionally situated at the C-19 position in the diterpene (Yehia et al. 2011). The films showed larger inhibition zones against Bacillus subtilis as compared with Staphylococcus aureus, indicating higher antimicrobial activities of the films against Bacillus subtilis as shown in Fig. 3. The effective components of neem extracts are phenolic compounds, carotenoids, ketones, steroids, triterpenoids, tetratriterpenoids, and azadirachtin (Monroe and Polk 2000). The antimicrobial activity of neem leaves extract-based seaweed films might be due to presence of carotenoids, phenolic compounds, flavonoids, triterpenoids, ketones, valavinoids, saponins, gilcosides, steroids, and tetra-triterpenoids azadirachtin in the neem leaves (Saradhajyothi KOONA and Budida 2011) because they are the principle antibiotics of the neem plant, used as a defensive mechanism against different pathogens (Hancock 1997). The film with 7.5 w/w% showed maximum activity against both of the gram – positive bacteria: Bacillus subtilis (25 mm) and Staphylococcus aureus (14 mm). The control seaweed film was had no activity against any of the tested bacterias. The neem leaves extract in seaweed-based films showed excellent (p < 0.05) antimicrobial activity towards Bacillus subtilis and Staphylococcus aureu, which is highly desirable criteria for packaging applications. All the films were ineffective against Gram negative Escherichia coli. Potentially, the cell wall of Escherichia coli prevented the active components from reaching the cytoplasmic membrane. These findings of this study were comparable with previous observations on antimicrobial activity of neem leaves on Escherichia coli (Francine et al. 2015). In this context, the antimicrobial activities of the neem leaves extract-based seaweed films were enhanced with the increase of the neem leaves extract concentration. This was confirmed from the larger inhibition zone on agar plates which contained higher concentration of neem leaves extract. This observation was similar to that of Esimone et al. (1998), where the increase in the concentration of extracts was proportional to an increase in the diameter of the inhibition zones. In this study, at low concentrations of neem leaves extract (0.5 w/w %) showed no inhibition on Bacillus subtilis and Staphylococcus aureus, which could be due to the insufficient quantities of active compounds in the neem leaves extract (0.5 % w/w), while an increase in the concentration of neem leaves extract contributed to the larger inhibition zones against the gram- positive bacteria. A series of neem leaves extract based seaweed films were successfully fabricated via solvent casting method using glycerol as plasticizer. The fabricated neem leaves extract based seaweed films showed substantial improvement in the water vapour permeability with excellent antimicrobial activity towards Staphylococcus aureus and Bacillus subtilis, which is highly desirable for the sustainable packaging application in the current scenario. The morphology of the fabricated films confirmed that there was good dispersion of the neem leaves extract in the seaweed matrix films and thereby resulted in the enhanced mechanical strength of the fabricated films. The incorporation of the neem leaves extract enhances the contact angle of the seaweed film from 44.45° to 71.45°. This clearly indicates that the addition of the neem leaves extract reduced the hydrophilicity of the seaweed film. The reduced hydrophilicity of the fabricated neem leaves extract based seaweed film was due to the hydrogen bonding between the hydroxyl groups in seaweed and hyroxyl groups in neem leaves extract which reduce the availability of hydroxyl groups thereby reduce the water vapor permeability of the neat seaweed film which is an important criterion for packaging application. The antimicrobial activities of the neem leaves extract- based seaweed films were enhanced with an increase in neem leaves extract concentration. The fabricated neem leaves extract-based seaweed films showed inhibitory zones against Staphylococcus aureus and Bacillus subtilis bacteria. The authors would like to appreciate the Universiti Sains Malaysia, Penang for providing the USM Fellowship and research grant 1001/PTEKIND/841020 and the contribution of the Federal Institute of Industrial Research Oshodi, Lagos Nigeria for successful completion of this research work. Saradhajyothi Koona, A., and Budida, S. (2011). “Antibacterial potential of the extracts of the leaves of indica Linn,” Not Sci Biol. 3(1), 65-69. Maragathavalli, S., Brindha, S., Kaviyarasi, N. S., Annadurai, B. B., and Gangwar, S. K. (2012). “Antimicrobial activity in leaf extract of neem (Azadirachta indica,” International Journal of Science and Nature 3(1), 110-3.